Idlis served with sambar and chutney is one of the most favourite snacks in South India. The basic idli is made with rice and udad dal. 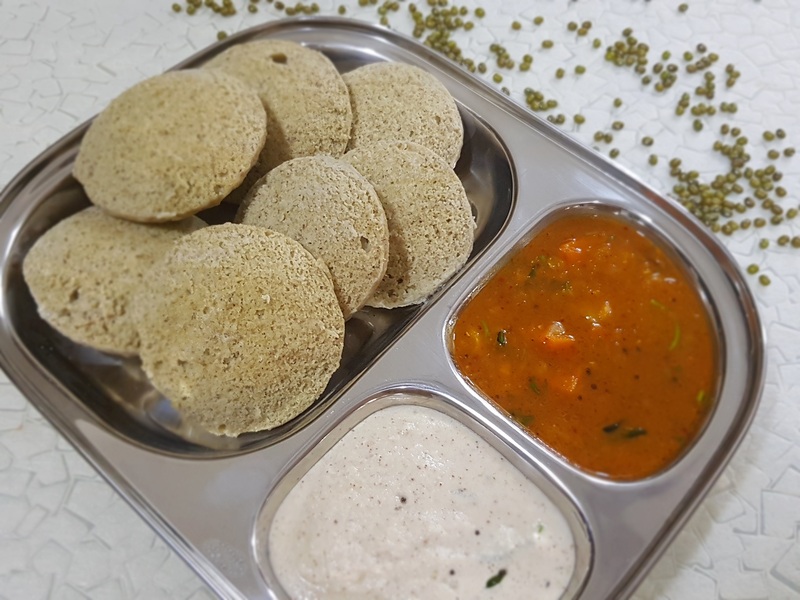 But, idlis can be made more interesting and healthy by replacing rice and udad dal with different ingredients like semolina, finger millets, green gram etc. Today I made idlis using whole moong and udad dal. Moong beans are a storehouse of nutrition. They are rich in protein and dietery fibers. Lets take a look at this healthy green gram idli recipe. Wash and soak whole moong (green gram) in water for 7 to 8 hours. Wash and soak udad dal (split black lentils) for 3 to 4 hours. Grind whole moong with very little water to a fine paste. Grind udad dal with very little water to a fine paste. In a broad vessel, mix the ground moong and ground udad dal well, beating vigorously. Keep the vessel aside (covered) for fermentation for 7 to 8 hours. After the batter is fermented, add salt as per taste and mix well. Grease idli plates and pour the batter into idli moulds. Steam the idlis for 20 to 25 minutes or till the idlis are cooked. Unmould the idlis and serve hot with chutney and sambar. If you love idlis, do have a look at the recipes of Kanchipuram idli, Oats Idli, Basic Idli and Mini masala idlis.